FTP Password Kracker is a free software to recover your lost FTP password directly from server. It uses brute-force password cracking method based on universal FTP protocol and can recover password from any FTP server. It automatically detects and alerts you if the target FTP server allows any Anonymous (without password) connections. In case your FTP server is running on different port (other than port 21) then you can easily specify the same in the tool along with server IP address. By default it includes sample dictionary (password list) file for password cracking. However you can find good collection of password dictionaries (also called wordlists) here & here. If your password is complex then you can use tools like Crunch, Cupp to generate brute-force based or any custom password list file and then use it with 'FTP Password Kracker'. For penetration testers and forensic investigators, it can be very handy tool in discovering poorly configured FTP accounts. It works on both 32 bit & 64 bit windows systems starting from Windows XP to Windows 8. Works against any FTP server. Option to specify non-standard FTP port. 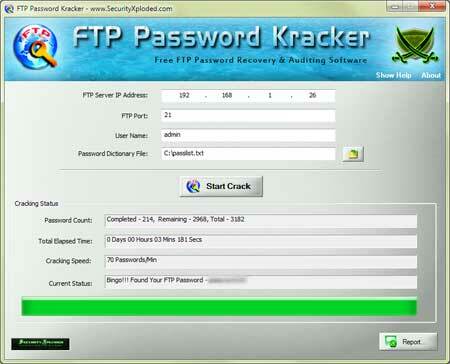 Install 'FTP Password Kracker' on any system. Enter the IP Address & Port number (default 21) of the FTP Server. Finally click on 'Start Crack' to start the FTP Password recovery.